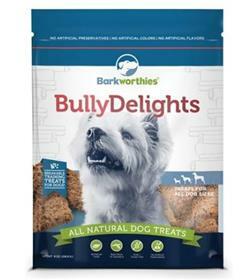 Give your dog something to bark about with Barkworthies Bully Delights Dog Treats. These delectable treats are made with bully flakes and 100% all-natural bully sticks that have been ground up into perfect little bite-sized delicacies. They can be easily broken up into smaller pieces for smaller canines or for training purposes. Plus, you can feel confident knowing that every chewy, beefy bite is sourced with the highest quality ingredients and baked right here in the USA! Ingredients: Beef Pizzle, Lentil Flour, Glycerin, Cane Molasses, Water for Processing, Cultured Skim Milk, Citric Acid (Preservative), Mixed Tocopherols (Preservative).